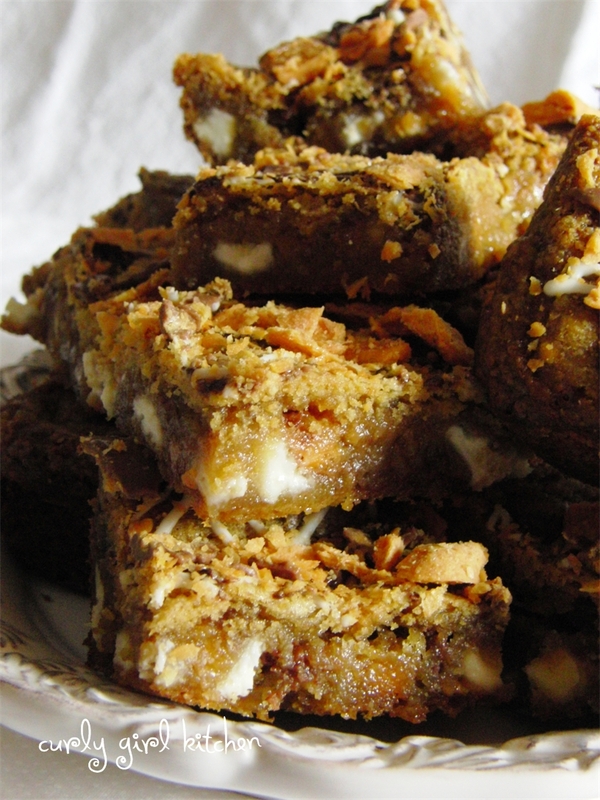 These are pure, decadent cookie bar bliss. 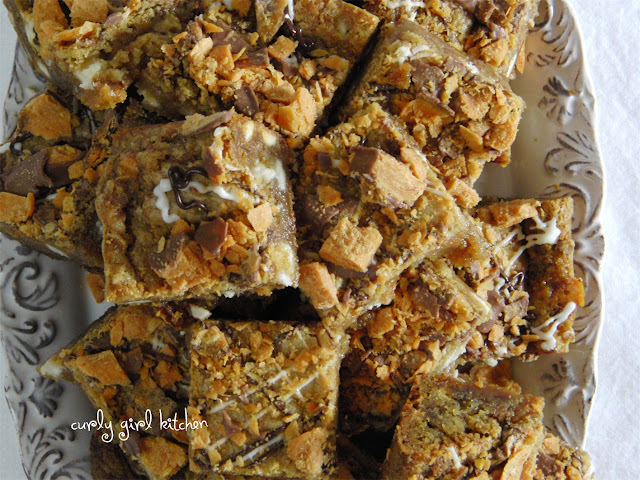 I made these for last Saturday night - Jamie was having a few guys over to watch the boxing fight - and remembering how much his friends loved the S'mores cookies I made a while back for their Fantasy Football draft, I suspected they would love these, too. It snowed that night, and the turnout at our place was small, so even I couldn't expect 5 guys to polish off a whole pan of cookie bars. So there were a few leftover which Jamie took to work on Monday, and he said his coworkers were mad - in a good way - because they could not stop eating them. 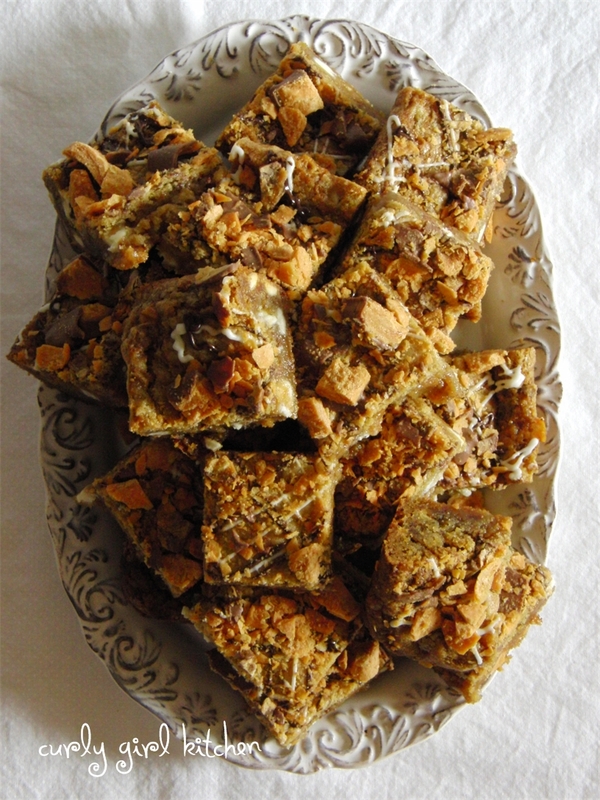 I adapted this recipe from Cookies & Cups' Butterfinger Blondies, but for my version I added cinnamon and white chocolate chips and eliminated the frosting, instead drizzling the top of the bars with a little melted chocolate and sprinkling chopped Butterfingers all over. I really didn't think they needed frosting as they are incredibly rich, sweet and buttery as they are. As kids, I don't think we got candy bars very often - candy was usually for Easter and other holidays or special days - so on the rare occasion that we were allowed to pick out a candy bar at the grocery store check out lane, I was likely to choose Butterfinger for myself. Just chocolate and those crunchy sweet and salty orange layers inside of whatever they're made of were the perfect simple sweet treat. I'd eat it slowly, nibbling away at it little by little, trying to make it last as long as possible. Well, I wouldn't blame you if your self control flies right out the window after you make these and take the first bite. Because they're just that good. Preheat the oven to 350. Spray a 9x13 baking dish with non-stick spray. In the bowl of your stand mixer fitted with the paddle attachment, beat the butter and both sugars until fluffy, 4-5 minutes. Add the vanilla and eggs and beat well. In a separate bowl, combine the flour, baking soda, cinnamon and salt; add by spoonfuls to the mixing bowl, mixing just until combined. Stir in the chopped butterfingers (reserving ½ cup for later) and the ½ cup chocolate chips. Spread the batter into the pan (it’s very thick, so it’s easiest to use your hands). Bake for 25 minutes; the cookies should be golden brown, but still a little gooey in the middle. Set on a wire rack and cool completely. Melt the 2 tablespoons white chocolate chips and semi-sweet chocolate chips (separately); scrape into a plastic zip-lock bag, snip off a tiny piece of the corner, and drizzle lightly over the top of the cookie bars. Sprinkle with the remaining ½ cup chopped butterfingers. Cut into bars and store any leftovers in an airtight container. sooooo good!! Easy to make and hard to stop eating!